Norwich captain Grant Holt marked his first start of the season with a brace as the Championship side dumped League Two Gillingham out of the Carling Cup. The Gills actually took the lead when Chris Palmer pounced on a defensive error to finish past keeper John Ruddy. But after Adebayo Akinfenwa hit the bar Norwich took control, Chris Martin levelling with a neat finish and Holt heading the Canaries into the lead. Holt then swept in a third and Martin scored one-on-one for Norwich's fourth. Norwich manager Paul Lambert told BBC Radio Norfolk: "The main thing was to win, which we did, and some of our players were terrific going forward, I'm delighted to get to the next round. "You see how important he [Grant Holt] is, he's not played much football or trained much. "Two goals will do his confidence the world of good, as it will Chrissy, it doesn't matter who you're playing, it's a difficult thing to do is win." Gillingham boss Andy Hessenthaler told BBC Radio Kent: "The scoreline flatters them a bit but if you defend the way we did you are going to concede goals aren't you? "You work on the training ground during the week. Their two centre forwards have got great movement but they are not outstandingly quick. We were far too deep. "I'm disappointed the players didn't listen. We did work on that, they have been told so, so it will be a tough few days." 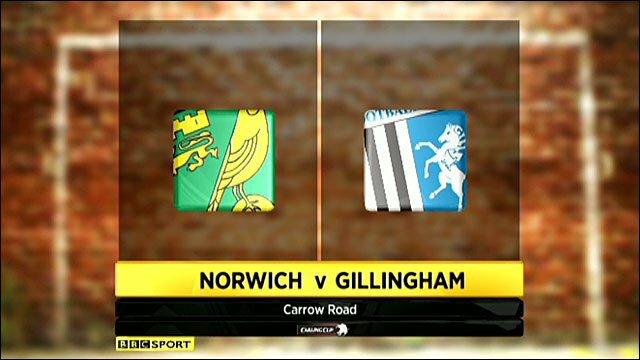 90:00+1:12 GOAL - Chris Martin:Norwich 4 - 1 Gillingham Goal by Chris Martin (Norwich) right-footed (bottom-left of goal) from right side of six-yard box (6 yards).Norwich 4-1 Gillingham. 89:59 Attacking throw-in by John Nutter (Gillingham). 89:44 Shot by Chris Martin (Norwich) right-footed from left channel (18 yards), save (caught) by Alan Julian (Gillingham). 87:58 Foul by Chris Martin (Norwich) on Tony Sinclair (Gillingham). Direct free kick taken right-footed by Alan Julian (Gillingham) from own half, resulting in open play. 87:21 Shot by Anthony McNamee (Norwich) left-footed from left channel (20 yards), blocked by Mark Bentley (Gillingham). 86:39 Cross by Chris Palmer (Gillingham), save (caught) by John Ruddy (Norwich). 86:23 Cross by Chris Palmer (Gillingham), clearance by Adam Drury (Norwich). 85:40 Defending throw-in by John Nutter (Gillingham). 85:10 Goal kick taken long by Alan Julian (Gillingham). 83:57 Free kick curled left-footed by Anthony McNamee (Norwich) from left channel (20 yards), missed left. 83:57 Booking Tony Sinclair (Gillingham) booked for unsporting behaviour. 83:57 Foul by Tony Sinclair (Gillingham) on Chris Martin (Norwich). 82:45 Substitution Gillingham substitution: Adebayo Akinfenwa replaced by Andy White (tactical). 82:45 Attacking throw-in by Tony Sinclair (Gillingham). 81:33 Cross by Danny Spiller (Gillingham), save (caught) by John Ruddy (Norwich). 79:33 Attacking throw-in by Russell Martin (Norwich). 79:18 Attacking throw-in by Russell Martin (Norwich). 78:24 Attacking throw-in by Russell Martin (Norwich). 78:24 Substitution Norwich substitution: Wesley Hoolahan replaced by Anthony McNamee (tactical). 77:24 Foul by Kevin Maher (Gillingham) on Wesley Hoolahan (Norwich). Free kick taken right-footed by Chris Martin (Norwich) from left channel (30 yards), save (caught) by Alan Julian (Gillingham). 76:51 Defending throw-in by Adam Drury (Norwich). 76:25 Defending throw-in by Tony Sinclair (Gillingham). 75:07 Cross by Tony Sinclair (Gillingham), save (caught) by John Ruddy (Norwich). 74:16 Chris Martin (Norwich) caught offside. Indirect free kick taken right-footed by Alan Julian (Gillingham) from own half, resulting in open play. 73:27 Cross by Adam Drury (Norwich), clearance by John Nutter (Gillingham). 73:08 Attacking throw-in by Adam Drury (Norwich). 72:30 Defending throw-in by Russell Martin (Norwich). 72:21 Goal kick taken long by Alan Julian (Gillingham). 72:11 Shot by Simon Lappin (Norwich) left-footed from centre of penalty area (12 yards), missed left. 69:50 Substitution Gillingham substitution: Luke Rooney replaced by Stefan Payne (tactical). 69:50 Defending throw-in by Tony Sinclair (Gillingham). 69:25 Goal kick taken long by John Ruddy (Norwich). 69:14 Header by Adebayo Akinfenwa (Gillingham) from centre of penalty area (12 yards), over the bar. 68:46 Foul by Wesley Hoolahan (Norwich) on Danny Spiller (Gillingham). Direct free kick taken right-footed by Danny Spiller (Gillingham) from right wing, resulting in open play. 68:10 Substitution Norwich substitution: David Fox replaced by Matthew Gill (tactical). 68:10 Defending throw-in by Adam Drury (Norwich). 67:50 Shot by Luke Rooney (Gillingham) drilled right-footed from left channel (20 yards), blocked by Michael Nelson (Norwich). 66:44 Cross by Korey Smith (Norwich), save (caught) by Alan Julian (Gillingham). 66:15 Cross by Andy Barcham (Gillingham), clearance by Russell Martin (Norwich). 65:57 Shot by Danny Spiller (Gillingham) left-footed from left side of penalty area (12 yards), save (caught) by John Ruddy (Norwich). 65:47 Cross by Chris Palmer (Gillingham), resulting in open play. 65:16 Attacking throw-in by Tony Sinclair (Gillingham). 64:39 Goal kick taken long by John Ruddy (Norwich). 63:34 Substitution Norwich substitution: Grant Holt replaced by Oli Johnson (tactical). 63:34 Defending throw-in by Tony Sinclair (Gillingham). 62:59 Inswinging corner from right by-line taken left-footed by Chris Palmer (Gillingham) to centre, clearance by Russell Martin (Norwich). 62:49 Cross by Andy Barcham (Gillingham), clearance by Adam Drury (Norwich). 61:49 Foul by Grant Holt (Norwich) on Josh Gowling (Gillingham). Direct free kick taken right-footed by Alan Julian (Gillingham) from own half, resulting in open play. 61:15 Goal kick taken long by Alan Julian (Gillingham). 59:51 Attacking throw-in by Danny Spiller (Gillingham). 59:18 Outswinging corner from left by-line taken right-footed by Chris Palmer (Gillingham) to centre, clearance by Chris Martin (Norwich). 58:41 Attacking throw-in by John Nutter (Gillingham). 58:09 Goal kick taken long by John Ruddy (Norwich). 57:24 Foul by Russell Martin (Norwich) on Josh Gowling (Gillingham). Direct free kick taken right-footed by Danny Spiller (Gillingham) from own half, passed. 57:06 Defending throw-in by Russell Martin (Norwich). 55:50 Inswinging corner from right by-line taken left-footed by Chris Palmer (Gillingham) to centre, clearance by Elliott Ward (Norwich). 54:35 Assist (cross) by Korey Smith (Norwich) from right wing. 54:35 GOAL - Grant Holt:Norwich 3 - 1 Gillingham Goal by Grant Holt (Norwich) volleyed right-footed (top-right of goal) from right side of penalty area (12 yards).Norwich 3-1 Gillingham. 54:19 Cross by Russell Martin (Norwich), clearance by Josh Gowling (Gillingham). 53:38 Attacking throw-in by Adam Drury (Norwich). 53:26 Attacking throw-in by Wesley Hoolahan (Norwich). 52:51 Foul by Adam Drury (Norwich) on Tony Sinclair (Gillingham). Direct free kick taken right-footed by Alan Julian (Gillingham) from own half, resulting in open play. 52:40 Attacking throw-in by Adam Drury (Norwich). 52:34 Cross by Wesley Hoolahan (Norwich), blocked by Tony Sinclair (Gillingham). 52:02 Foul by Mark Bentley (Gillingham) on Chris Martin (Norwich). Direct free kick taken right-footed by David Fox (Norwich) from right channel, passed. 51:22 Corner from left by-line taken short right-footed by David Fox (Norwich). 51:05 Foul by Josh Gowling (Gillingham) on Grant Holt (Norwich). Direct free kick taken left-footed by Wesley Hoolahan (Norwich) from left channel, passed. 50:38 Attacking throw-in by Adebayo Akinfenwa (Gillingham). 50:27 Defending throw-in by Russell Martin (Norwich). 49:57 Goal kick taken long by John Ruddy (Norwich). 49:28 Attacking throw-in by John Nutter (Gillingham). 48:56 Foul by Grant Holt (Norwich) on Danny Spiller (Gillingham). Direct free kick taken right-footed by Tony Sinclair (Gillingham) from own half, resulting in open play. 48:42 Defending throw-in by Adam Drury (Norwich). 48:23 Defending throw-in by Tony Sinclair (Gillingham). 46:58 Foul by Adam Drury (Norwich) on Kevin Maher (Gillingham). Direct free kick taken right-footed by Danny Spiller (Gillingham) from own half, resulting in open play. 46:20 Adam Drury (Norwich) caught offside. Indirect free kick taken right-footed by Alan Julian (Gillingham) from own half, resulting in open play. 46:05 Attacking throw-in by Adam Drury (Norwich). 45:55 Attacking throw-in by Adam Drury (Norwich). 45:24 Foul by Adebayo Akinfenwa (Gillingham) on Elliott Ward (Norwich). Direct free kick taken right-footed by John Ruddy (Norwich) from own half, resulting in open play. 45:00+1:45 Foul by Adebayo Akinfenwa (Gillingham) on David Fox (Norwich). Direct free kick taken right-footed by John Ruddy (Norwich) from own half, resulting in open play. 45:00+1:40 Defending throw-in by Tony Sinclair (Gillingham). 45:00+0:53 Attacking throw-in by Tony Sinclair (Gillingham). 45:00+0:18 Foul by Russell Martin (Norwich) on Adebayo Akinfenwa (Gillingham). Direct free kick taken left-footed by John Nutter (Gillingham) from own half, resulting in open play. 45:00+0:06 Defending throw-in by John Nutter (Gillingham). 44:28 Attacking throw-in by Adam Drury (Norwich). 43:17 Cross by Simon Lappin (Norwich), clearance by Luke Rooney (Gillingham). 41:31 Substitution Gillingham substitution: Jack Payne replaced by Kevin Maher (injury). 39:49 Shot by Jack Payne (Gillingham) right-footed from right channel (20 yards), save (parried) by John Ruddy (Norwich). Shot by Adebayo Akinfenwa (Gillingham) right-footed from centre of penalty area (18 yards), missed left. Goal kick taken long by John Ruddy (Norwich). 38:51 Defending throw-in by Adam Drury (Norwich). 38:43 Goal kick taken long by Alan Julian (Gillingham). 37:24 Foul by Luke Rooney (Gillingham) on Grant Holt (Norwich). Free kick taken right-footed by Chris Martin (Norwich) curled from left channel (25 yards), hit bar. 36:39 Grant Holt (Norwich) caught offside. Indirect free kick taken right-footed by Alan Julian (Gillingham) from own half, passed. 36:11 Inswinging corner from left by-line taken right-footed by David Fox (Norwich) to centre, save (punched) by Alan Julian (Gillingham). 35:21 Foul by Josh Gowling (Gillingham) on Grant Holt (Norwich). Direct free kick taken left-footed by Simon Lappin (Norwich) from right wing, header by Grant Holt (Norwich) from centre of penalty area (12 yards), blocked by Chris Palmer (Gillingham). 32:58 Shot by Luke Rooney (Gillingham) volleyed right-footed from right channel (20 yards), blocked by Michael Nelson (Norwich). 32:02 Shot by Adebayo Akinfenwa (Gillingham) right-footed from right channel (25 yards), blocked by Adam Drury (Norwich). 31:01 Assist (cross) by Russell Martin (Norwich) from right wing. 31:01 GOAL - Grant Holt:Norwich 2 - 1 Gillingham Headed goal by Grant Holt (Norwich) (top-right of goal) from centre of penalty area (12 yards).Norwich 2-1 Gillingham. 29:11 Defending throw-in by Russell Martin (Norwich). 28:08 Inswinging corner from right by-line taken left-footed by Simon Lappin (Norwich) to centre, shot by Wesley Hoolahan (Norwich) left-footed from centre of penalty area (12 yards), missed left. Goal kick taken long by Alan Julian (Gillingham). 26:44 Foul by Adebayo Akinfenwa (Gillingham) on Michael Nelson (Norwich). Direct free kick taken right-footed by Michael Nelson (Norwich) from own half, passed. 25:43 Assist (pass) by Grant Holt (Norwich) from right channel. 25:43 GOAL - Chris Martin:Norwich 1 - 1 Gillingham Goal by Chris Martin (Norwich) right-footed (bottom-left of goal) from right side of penalty area (12 yards).Norwich 1-1 Gillingham. 24:21 Goal kick taken long by John Ruddy (Norwich). 22:38 Foul by Korey Smith (Norwich) on Danny Spiller (Gillingham). Direct free kick taken right-footed by Danny Spiller (Gillingham) from left wing, header by Adebayo Akinfenwa (Gillingham) from centre of penalty area (12 yards), hit bar. 22:01 Defending throw-in by John Nutter (Gillingham). 20:21 Shot by Korey Smith (Norwich) left-footed from left channel (20 yards), blocked by Luke Rooney (Gillingham). 19:43 Inswinging corner from right by-line taken left-footed by Simon Lappin (Norwich) to far post, clearance by Danny Spiller (Gillingham). 19:37 Cross by Russell Martin (Norwich), clearance by Josh Gowling (Gillingham). 18:13 Cross by Simon Lappin (Norwich), clearance by Josh Gowling (Gillingham). 16:49 Foul by Simon Lappin (Norwich) on Danny Spiller (Gillingham). Direct free kick taken right-footed by Alan Julian (Gillingham) from own half, resulting in open play. 16:27 Foul by Mark Bentley (Gillingham) on Grant Holt (Norwich). Direct free kick taken right-footed by Grant Holt (Norwich) from left channel, resulting in open play. 15:46 Wesley Hoolahan (Norwich) caught offside. Indirect free kick taken right-footed by Alan Julian (Gillingham) from own half, resulting in open play. 15:30 Cross by Adam Drury (Norwich), clearance by Mark Bentley (Gillingham). 15:07 Attacking throw-in by Simon Lappin (Norwich). 14:49 Cross by Tony Sinclair (Gillingham), save (caught) by John Ruddy (Norwich). 13:48 Foul by Grant Holt (Norwich) on Danny Spiller (Gillingham). Direct free kick taken left-footed by John Nutter (Gillingham) from left channel, resulting in open play. 12:26 Cross by Chris Palmer (Gillingham), save (caught) by John Ruddy (Norwich). 12:11 Attacking throw-in by John Nutter (Gillingham). 11:01 GOAL - Chris Palmer:Norwich 0 - 1 Gillingham Goal by Chris Palmer (Gillingham) left-footed (bottom-right of goal) from left side of penalty area (18 yards).Norwich 0-1 Gillingham. 10:54 Defending throw-in by John Nutter (Gillingham). 10:18 Attacking throw-in by Jack Payne (Gillingham). 9:32 Foul by Korey Smith (Norwich) on Chris Palmer (Gillingham). Direct free kick taken right-footed by Alan Julian (Gillingham) from own half, resulting in open play. 9:15 Inswinging corner from right by-line taken right-footed by David Fox (Norwich) to centre, clearance by Mark Bentley (Gillingham). 9:01 Cross by Korey Smith (Norwich), save (tipped over) by Alan Julian (Gillingham). 8:22 Cross by Russell Martin (Norwich), clearance by John Nutter (Gillingham). 8:12 Attacking throw-in by Korey Smith (Norwich). 8:03 Cross by Adam Drury (Norwich), clearance by Chris Palmer (Gillingham). 7:12 Defending throw-in by Tony Sinclair (Gillingham). 6:37 Inswinging corner from left by-line taken right-footed by David Fox (Norwich) to centre, clearance by Chris Palmer (Gillingham). 6:02 Foul by Grant Holt (Norwich) on Tony Sinclair (Gillingham). Direct free kick taken right-footed by Jack Payne (Gillingham) from own half, passed. 5:47 Goal kick taken long by Alan Julian (Gillingham). 4:20 Free kick taken right-footed by David Fox (Norwich) from right channel (35 yards), hit post. 4:20 Booking David Fox (Norwich) booked for unsporting behaviour. 4:20 Foul by Jack Payne (Gillingham) on Wesley Hoolahan (Norwich). 3:51 Defending throw-in by Tony Sinclair (Gillingham). 3:01 Cross by Luke Rooney (Gillingham), save (caught) by John Ruddy (Norwich). 2:41 Attacking throw-in by Jack Payne (Gillingham). 2:33 Cross by Tony Sinclair (Gillingham), blocked by Adam Drury (Norwich). 2:15 Foul by Michael Nelson (Norwich) on Chris Palmer (Gillingham). Direct free kick taken right-footed by Luke Rooney (Gillingham) from left channel, resulting in open play. 1:47 Goal kick taken long by Alan Julian (Gillingham). 1:23 Shot by Chris Martin (Norwich) lobbed right-footed from right side of penalty area (12 yards), over the bar. 0:22 Foul by Korey Smith (Norwich) on Chris Palmer (Gillingham). Direct free kick taken left-footed by Chris Palmer (Gillingham) from left channel, passed.